Wow, has it been 3 months already? 64 posts about loving ice cream (well, this one makes 65), not to shabby if I do say so myself. This all started because even know so many people love ice cream, very few seem to write about it. These last 3 months have been an interesting experience, and the state of the freezer? It ain't pretty, but we'll get to that in a moment. Blogging isn't necessarily hard, but it does take some real dedication. 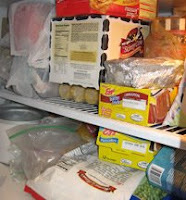 And then there is blogging to review things, which adds in both more time and money, but hey, I was going to buy ice cream anyway, now I just spend a bit more time in the freezer section trying to broaden my horizons, that's all. So, the state of the freezer? It's full, very full. There are currently *6* containers of brand name ice cream in our freezer. On top of that, I still have a bit of homemade ice cream from the weekend, and for some strange reason, I still have the first flavor I made well over a month ago (yeah, I probably not eatin' it at this point). There's also the big box of disappointing skinny cow ice cream sandwiches. To top it off, for some reason, I have managed to collect 6 different kinds of popsicles, all with just one left of each brand, not sure how I pulled that off. Of course, this is on top of all the veggies and frozen breakfast foods that are normally in our freezer. So, now that I've hit the 3 month mark, where do I want to go from here? First, I need a real domain name for this blog. Second, I hope traffic picks up, I'd love to get peoples comments on various flavors (meaningful comments, not "I hate that flavor"). Third, I need to work on how I acquire and keep flavors because freezer burn is not my friend. Fourth, gotta keep the drive alive! I post an average of 5 times a week. If I do a treat of the week, and one trip to a local place (usually Uhlman's), that still leaves 3 flavors a week to review. Sometimes one of those flavors will be homemade, but that all depends on how busy our weekends are. There are only 3 of us to polish off all this ice cream, so maybe I need to have a few more kids to help cycle through the ice cream faster, or maybe have an ice cream party to clear out the freezer. Lastly, I hope I don't run out of flavors. I mean, a daily scoop was a great idea, but the creator has long burned out on writing a blog since starting grad school at the end of 2006. Maybe I just need to slow down, but I've been having too much fun. Not only does ice cream taste great, but I really thing it's a great way to relax and "chill out" ...sorry, had to say it. Nowadays, we could all stand to relax a bit. Hopefully the additions of treat of the week, topping of the week, etc will keep things exciting and diverse enough for all to enjoy. Audience participation is a beautiful thing, so feel free to send me any suggestions you might have.